In this recently discovered transcript of a three day interview conducted in 1916, Nikola Tesla, using words and graphic illustrations, provides a step by step description of his remarkable accomplishments in the area of radio frequency engineering. 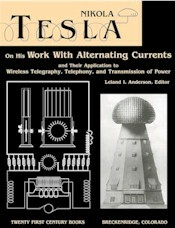 In a style uniquely his own, Tesla carefully traces his work�from the first high frequency alternators constructed at his New York City Grand Street laboratory and the associated tuned RF circuits through the establishment of his huge broadcasting facility, the Wardenclyffe Plant, at Shoreham, Long Island. Among the variety of topics discussed are: high frequency alternators, experiments with wireless telegraphy and telephony, mechanical and electrical oscillators, the Colorado experiments, theory and technique of energy transmission, the Long Island plant, and arrangements for receiving. Seldom, in technical research, has such a treasure of descriptive commentary and historical documentation been discovered. The previously untold story found within the pages of this remarkable book has been described by prominent Tesla researcher James Corum as a "veritable Rosetta stone" for tracing the technical thoughts of one of our most distinguished engineering scientists. Includes 61 photos and 42 line-art illustrations, many never before published. This [Fig. 43] shows the first single step I made toward the evolution of an apparatus which, given primary oscillations, will transform them into oscillations capable of penetrating the medium. 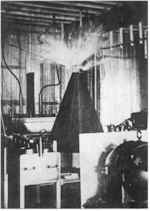 That experiment, which was marvelous at the time it was performed, was shown for the first time in 1894. I remember the incident perfectly. I called Mr. Edward Adams, the banker, to come and see it, and he was the first man to observe it and to hear my explanation of what it meant. This coil, which I have subsequently shown in my patents Nos. 645,576 and 649,621, in the form of a spiral, was, as you see in the form of a cone. The idea was to put the coil, with reference to the primary, in an inductive connection which was not close�we call it now loose coupling�but free to permit great resonant rise. That was the first single step, as I say, toward the evolution of an invention which I have called my "magnifying transmitter." That means, a circuit connected to ground and to an antenna, of a tremendous electromagnetic momentum and small damping factor, with all the conditions so determined that an immense accumulation of electrical energy can take place. . . .
To be more explicit, I take a very large self-inductance and a comparatively small capacity, which I have constructed in a certain way so that the electricity cannot leak out. I thus obtain a low frequency; but, as you know, the electromagnetic radiation is proportionate to the square root of the capacity divided by the self-induction. I do not permit the energy to go out; I accumulate in that circuit a tremendous energy. When the high potential is attained, if I want to give off electromagnetic waves, I do so, but I prefer to reduce these waves in quantity and pass a current into the earth, because electromagnetic wave energy is not recoverable while that [earth] current is entirely recoverable, being the energy stored in an elastic system. You see, the apparatus which I have devised was an apparatus enabling one to produce tremendous differences of potential and currents in an antenna circuit. These requirements must be fulfilled, whether you transmit by currents of conduction, or whether you transmit by electromagnetic waves. You want high potential currents, you want a great amount of vibratory energy; but you can graduate this vibratory energy. By proper design and choice of wave lengths, you can arrange it so that you get, for instance, 5 percent in these electromagnetic waves and 95 percent in the current that goes through the earth. That is what I am doing. Or you can get, as these radio men, 95 percent in the energy of electromagnetic waves and only 5 percent in the energy of the current. . . . The apparatus is suitable for one or the other method. I am not producing radiation with my system; I am suppressing electromagnetic waves. . . . In my system, you should free yourself of the idea that there is radiation, that the energy is radiated. It is not radiated; it is conserved. Who was Nikola Tesla? In 1896 Lord Kelvin said, "Tesla has contributed more to electrical science than any man up to his time." After showering words of praise upon the inventor before a meeting of the Royal Society in London in 1892, Lord Rayleigh declared that Tesla possessed a great gift for electrical discovery. This opinion is confirmed by the fact that Tesla was one of the earliest scientists to understand the distinction between lumped and distributed resonance and the first to patent voltage magnification by standing waves. The unit of magnetic induction is named in honor of Tesla. It is commonly understood by power engineers that he was the inventor of the induction motor utilizing the rotating magnetic field and the AC polyphase power distribution system, currently in place throughout the civilized world. However, most electrical engineers are unaware that, as late as 1943, Nikola Tesla�not Marconi�was recognized by the U.S. Supreme Court as having priority in the invention of "radio." And, most computer scientists are unaware that, when certain hardware manufacturers attempted to patent digital logic gates after World War II, the U.S. Patent Office asserted Tesla's turn-of-the-century priority in the electrical implementation of logic gates for secure communications, control systems, and robotics. Tesla served the electrical engineering profession in its highest offices. In the early 1890s, he was elected for a two year term as vice president of the American Institute of Electrical Engineers, now the Institute of Electrical and Electronics Engineers (IEEE). At the time of his election Alexander Graham Bell was its president. It should be noted that Tesla was a fellow of the AIEE, the American Association for the Advancement of Science, and a dozen other professional societies. He received over thirteen honorary degrees from such diverse institutions as Columbia, Yale, and the Universities of Paris, Vienna, Prague, and Sofia.